Premium Quality, Heat Sintered ,Wet Resin Diamond Polishing Pads are Specially Formulated to Produce Superior Polishing Results on Marble, Granite and Natural Stone. Apex® Pads are made with High Grade Premium Diamonds for Fast Polishing Results and Increased Longevity. 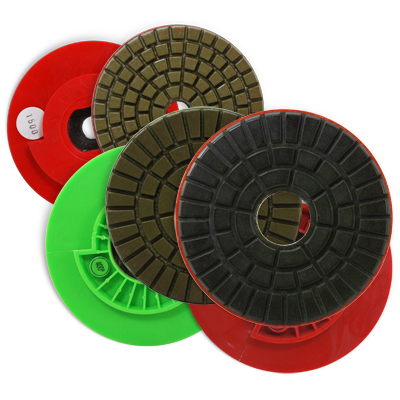 Professional Quality 3 Step 4" Wet Resin Diamond Polishing Pads are Specially Formulated with Heat Sintered Diamonds to Produce Superior Polishing Results on Marble, Granite and Natural Stone. Bella® Pads are made with the Highest Grade Diamonds for Best Polishing Results & Maximum Longevity. 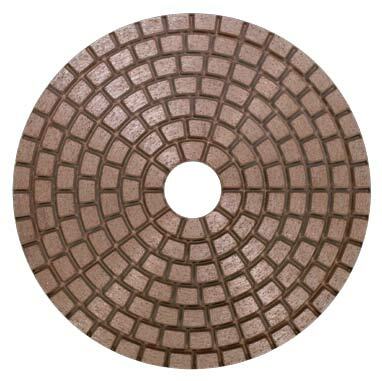 Supreme Quality, 4" Wet Resin Diamond Polishing Pads are Specially Formulated and Heat Sintered to Produce Superior Polishing Results on Marble, Granite and Natural Stone. Bella® Pads are made with the Highest Grade Supreme Diamonds for Best Polishing Results & Maximum Longevity. Professional Quality, 4" (100mm) Copper Bond Diamond Polishing Pads Delver Exceptionally Fast, Clean & Scratch Free Grinding & Polishing of Marble, Granite & Natural Stone. Faster Polishing Performance & Maximum Longevity Over Standard Resin Pads. 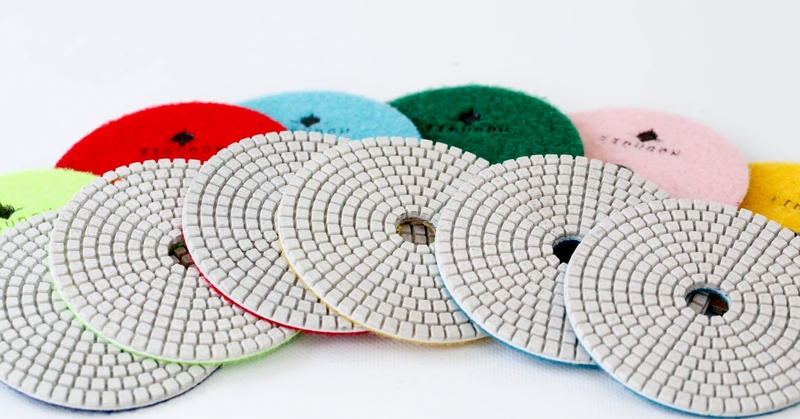 Premium Quality, 4" Wet White Resin Diamond Polishing Pads are Specially Formulated and Heat Sintered to Produce Superior Polishing Results on Engineered Stone & High Quartz Solid Surface Materials Including Silestone, Caesar Stone & Zodiaq. Won't Burn or Discolor Light & Dark Material. Made with High Grade Premium Diamonds for Fast Polishing Results and Increased Longevity. 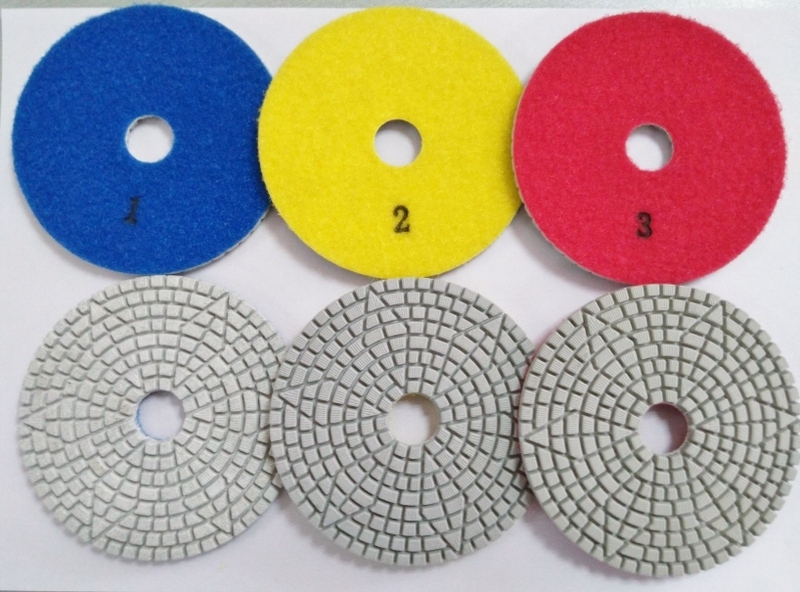 Professional Quality 4" & 5" Metal Bond, Diamond Dot Grinding & Polishing Pads Delver Exceptionally Fast, Clean & Scratch Free Grinding & Polishing of Marble, Granite & Natural Stone. Enhanced Grinding Performance Without the Bounce or Chattering Normally Experienced with Turbo Cup Wheels. Five Times the Life Over Resin Pads - Maximum Longevity! 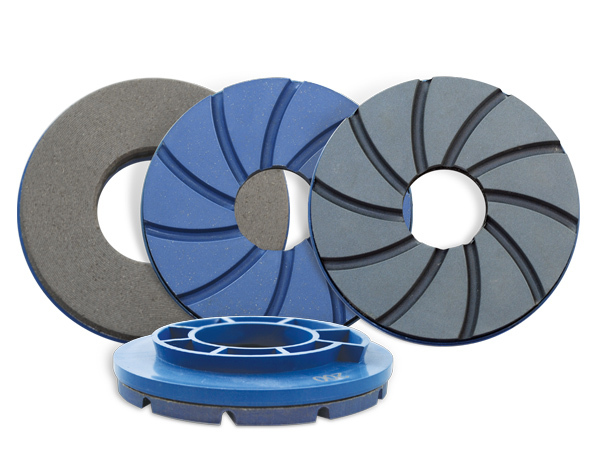 5" (125mm) C Frame, Pro Edge Snail Lock Polishing Pads Deliver Unsurpassed Polishing Results on Round and Flat Marble, Granite, Engineered and Natural Stone Edges. Innovative Design Enables Water Flow Between Pad and Material Edge Preventing Burn Marks and Marring on Engineered Stone. Polish Flat, Bevel, Half and Full Bullnose, Pencil Round and Common Profiles. Utilize on Park Industries, Marmo Meccanica, Sasso Meccanica, Commanduli, Montresor, Breton & GMM Machines. 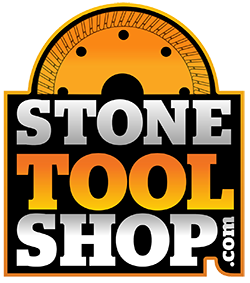 4" (100mm) C Frame, Premium Edge Snail Lock Polishing Pads Deliver Excellent Polishing Results on Round and Flat Marble, Granite, Engineered and Natural Stone Edges. Proven Design Enables Water Flow Between Pad and Material Edge Preventing Burn Marks and Marring on Engineered Stone. Polish Flat, Bevel, Half and Full Bullnose, Pencil Round and Common Profiles. 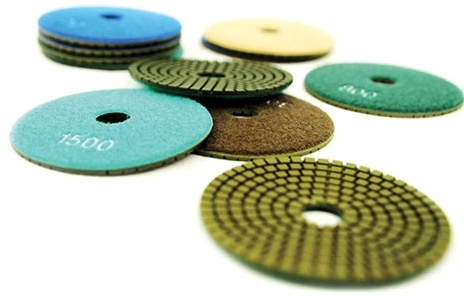 5" (125mm) C Frame, Premium Edge Snail Lock Polishing Pads Deliver Excellent Polishing Results on Round and Flat Marble, Granite, Engineered and Natural Stone Edges. Proven Design Enables Water Flow Between Pad and Material Edge Preventing Burn Marks and Marring on Engineered Stone. Polish Flat, Bevel, Half and Full Bullnose, Pencil Round and Common Profiles. 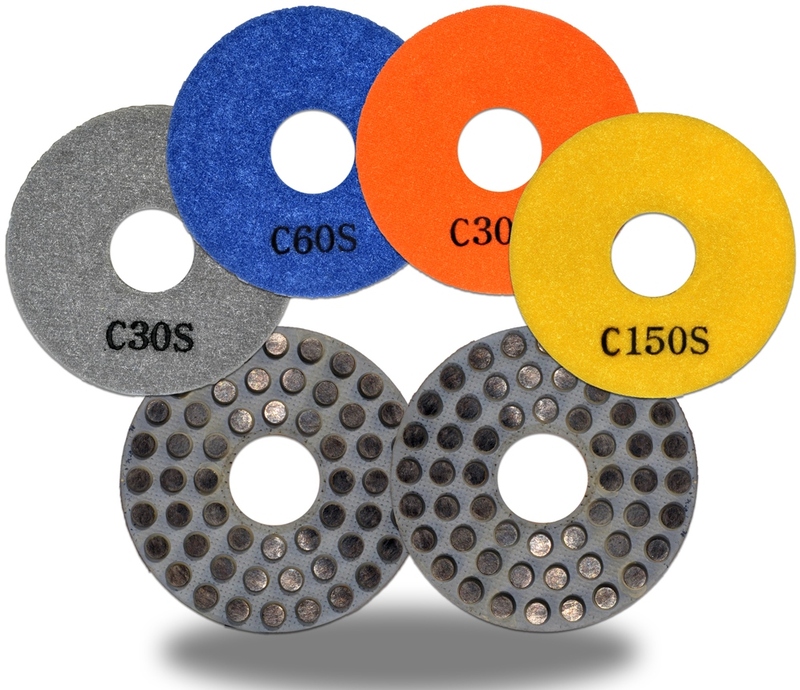 Professional Quality, 4" (100mm) Vitrified Polishing Pads Deliver Fast and Efficient Removal of Saw & Grinding Marks on Granite and Harder Marble - an Effective Pre-Polish Pad Efficiently Shapes and Hones Natural Stone. Highest Quality Diamond Crystals Ensure Best Finish. Vitrified Pads are Bonded with Compressed Diamond Pellets Encased in Highly Engineered Plastic for Maximum Longevity & Performance.